The highlighted URL parts the the once that have to be modified before you add it to the program. You can recognize this parameter by having a look at page 2,3,4… and see what numbered parameter increases. Usually it increases by 1 or by the numbe rof links you see on the page. Basically you have two types of search engines. 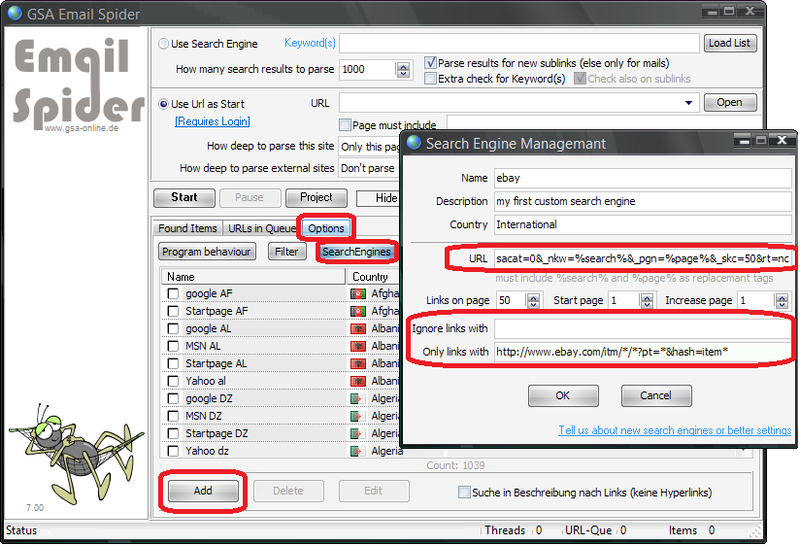 These will give you results of external links not belonging to the same domain as the search engine (e.g. google.com). In that case you copy all Links that have nothing to do with the results and make a big mask out of it. These will give you internal URLs that will point to sublinks on the same domain (as in this example). Let's copy like 3 URLs from the wanted result links and see what they have in common. Exchange everything they have not in common with a “*”.